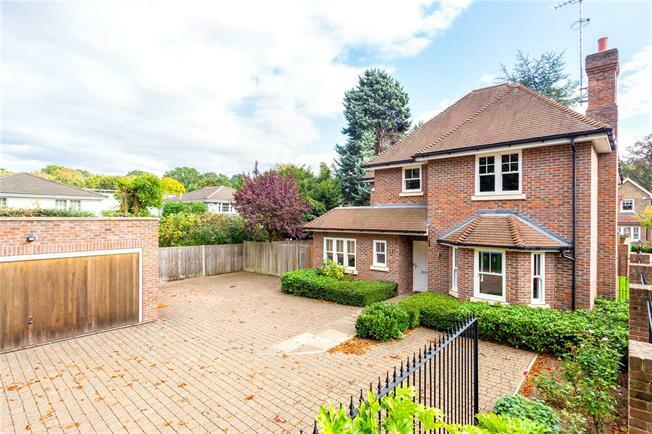 5 Bedroom Detached House For Sale in Esher for Offers in excess of £1,500,000. An attractive, executive modern home with nearly 3000 sq ft of accommodation ideally located for both Esher High Street and the station. A large entrance hallway welcomes you to this fabulous family home, to the rear is the vast open plan kitchen area, with different ‘zones’ for family, dining and sitting, this space is the ‘hub’ of family life and further complimented with a vaulted ceiling and skylights. The smart kitchen area is well equipped with 2 fridge freezers, double oven and breakfast bar. To complete the ground floor there is a utility, study and formal ‘double’ reception room with bay window. Upstairs there are 5 bedrooms and 4 bathrooms, the master has a ‘walk through’ wardrobe area to a large en-suite. There is ample storage throughout the house, including a ‘loft’ area for storing suitcases etc. This smart home has been built to a high specification with solid concrete floors and under floor heating, making this house ideal for buyers wanting a large property with low maintenance in a great location. Little Orchard Place is a private develpment set in an ideal location - midway between Esher High Street and the Station. Buyers really do get the ‘best of both worlds’ - the lifestyle and buzz of the High Street with its range of independent shops and boutiques, a selection of restaurants, cinema, colourful café culture and Waitrose supermarket combined with easy access to the station with trains to Waterloo in approximately 23 minutes. Littleworth Common is situated within meters, a tranquil space to go for a short walk. The area is well renowned for its excellent range of independent and state schools, Esher Church, Shrewsbury Lodge and Claremont Fan Court schools are all popular choices. Esher is the first town just off A3 outside greater London, J10 of the M25 is only 3.5 miles away giving access to both Heathrow (13 miles) and Gatwick (26 miles) airports. The rear garden has a southerly orientation, ideal for sunshine during the day. The garden offers extra space to the side, and this area could be used to ‘hide’ the childrens climbing frame etc. To the front there is plenty of parking and a detached double garage.